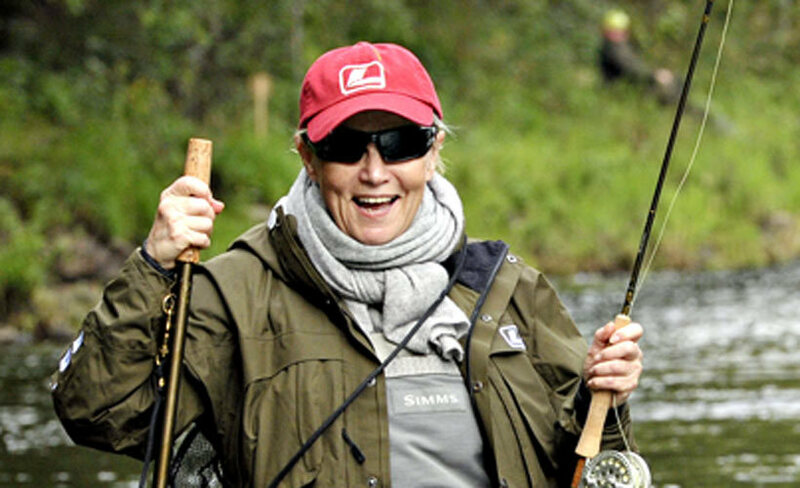 I had to pinch my arm twice, check out it wasn’t 1st of April, and run a virus control on my computer when I saw this headline on the Finnish news: Katri Helena took place in the womens’ fly fishing championships in Finland. For any Finn, Katri Helena is the face of adult oriented schlager pop in Finland, and has been for decades. Quite surprisingly, she indeed did take part on the fly fishing competition last weekend and did pretty well, too. With a 47cm rainbow trout she took the 5th place out of 10 competitors. How did this happen? And has she seen our version of her monster hit “Katson Autiota Hiekkarantaa” (“I’m Gazing at the Deserted Sandy Beach”) on the Karaoke video we published? No matter what – our paths seem to mysteriously intertwine. Katri, if you ever read this, why don’t we play a gig or go fishing together? Katri, if you’re reading this: we’d love to go fishing and/or play with you next time we come to Finland. We’re your biggest fans! That would be a true pleasure! Ok, now I just want to see Juha Mieto do some casting and then I’ve seen everything. I’m thinking of putting out a page on nostalgic cly fishing stories. Would you guys be interested in posting a story? Joana I am also one of the fans of Katri Helena I just want to say congratulations idol. I really love her song Sydameni Laulut. Thank you for your post it is the first time I know the full information that she became fifth in the fly fishing competition because I am very busy with my assigned projects these past few months. I have heard it but with insufficient information I am really glad I read your post. I want to share with you about my dream I want to fish with her in keyword having our food, eating into the boat and sharing experiences about our lives. I am not a fanatic before but after hearing her song especially Sydameni Laulut it changed me a lot. It inspires me to sing even just in the bathroom I just want to reveal that I am a frustrated singer thank you Katri Helena. Ladyfish wow! That is my favorite fish I always want to catch one. Capt. Geoff Bennett you did a great catch. You are so amazing. I hope we can fish together. I just want to share this to you. Last time when I am fishing in Pawleys Island fishing report. I am expecting to catch lady fish but unfortunately I am always going home with trout fish but I am also happy. The first time I have seen 4 lbs ladyfish when my father accompanies me. Because of my frustration in catching fish he helped me and thanks God we succeed. Have you catch tiger bass?